Victoria, Mahe (Seychelles) – February 26, 2018 (travelindex.com) – Seychelles has long earned bragging rights concerning its leadership in the field of environmental protection, and our proactive efforts in sustainable practise. Last week’s article by Sasha Lekach on Travel Wire News pertaining to Telsa providing “Wall Connectors” to offices free of charge so that employees can charge their electric vehicles while they work has reinforced the ideal that we ought to be moving towards environmentally-friendly transport if we are to do our part for a better and cleaner world. Seychelles offers tax reduction incentives for electric or hybrid vehicles. With the move towards environmentally-friendly transport, it would be beneficial if Taxi services and the Tourism Industry could embrace this movement for a greener Seychelles. Incentives could include providing a charger to hotels, Taxi Ranks, the Ferry Port and the SCAA at the airport. Businesses and Government would need to take steps to install chargers at key points where staff and members of the public may recharge their electric vehicles as needed. 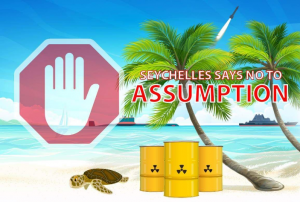 With the rising costs in petrol and diesel, and the alarming duty on non-electric or hybrid vehicles, it is an accepted fact that Seychelles will have little option but to move down this path sooner rather than later. Work permits are invaluable for the smooth running of any business operation, especially in the tourism industry where skilled and willing Seychellois staff may be lacking. When a hotel operation is faced with work permit difficulties with the Government, despite being within their agreed quota of foreign versus the local workforce, the system starts to break down. No hotel company or owner would, or should really be forced to, employ someone just for the sake of it. Moreover, local politics or domestic issues within companies cannot and should never be considered as mitigating factors for approval or refusals of work permits for the position of General Managers or any senior management staff for that matter. There are many known cases of disgruntled staff members or vindictive minority shareholders of a company calling immigration to have a work permit refused or revoked. Alarmingly, in many cases it would appear that these requests are honoured without hesitation. Proper procedure must be duly followed at all times by Government workers, otherwise their decisions will continue to be perceived as arbitrary and questionable. The use of bicycles as a means of transportation on the island of La Digue is a way of life for the locals, and a novel experience for many tourists. A recent horrific bicycle accident on La Digue has prompted many to voice their concerns regarding the lack of regulation for bicycle users or businesses who hire or rent out the bicycles to visitors to the island. Renting a bicycle on La Digue should be no different to renting a car on Praslin or Mahe. Clients must be made aware of the inherent risks in riding a bicycle along the cobbled roads, especially when they share the pathways with ox carts and other vehicles. An aggravating factor is that the clients are not provided with safety equipment, such as helmets, nor are businesses compelled to provide them by law with each bicycle hire. On 14th February 2018, a well reputed surgeon by profession, visitor to the island, fell from his bicycle after pedalling down a steep incline. He was not wearing a helmet. The injuries he sustained were life threatening and he had to be airlifted out of the country with spine and neck injuries. We met the wife of the injured and, as much as she was thankful for the care her husband received in the Intensive Care Unit at the Seychelles Hospital, her thanks and appreciation went to Anny Esparon, the Front Office Manager of Le Domaine de L’Orangeraie Resort, who went beyond the call of duty to display her devotion to the island’s tourism industry, and her unrelenting kindness to two tourists in their time of need. This recent meeting on La Digue with the members of the island’s business community was chaired by PS for Tourism, Anne Lafortune. Demands were made for further consultation with the business community to empower them as partners for the development of their island. They emphasised that oftentimes decisions are made by desk officers on Mahe, and implemented without the input of the Diguois; businesses on La Digue consequently struggle with the ramifications of such decisions, which tend to be unrealistic and unnecessarily inconvenience business owners. A case in point is the prevention of hotel golf buggies from carrying the hotel’s small 14kg gas bottle or small cartons of food stuff, an impractical embargo especially considering that the island has restricted the presence of pickup trucks. We have recently learned that this situation may soon be changed for the benefit of the islanders. Had this absurdity been allowed to continue, Diguois would have been forced to walk about with cartons of milk balanced on their heads, with a gas bottle clutched in one hand and a bag of groceries in the other, while the desk officers on Mahe snicker from afar. Another example of absurdity is that of a small business which was granted permission to import a golf buggy, but authority to transport it to La Digue was denied until the opening of the hotel, ignoring the pertinent fact that the vehicle was meant to assist the hotel owner with the pre-opening stage of the operation. This is an example of the left hand not knowing what the right hand is doing, and a possible explanation for Seychelles’ poor ranking in the ‘Ease of Doing Business’ table. The uproar surrounding the deal between India and the Government of Seychelles continues unabated because of the closeness of this proposed military base by a foreign power to Aldabra, the UNESCO World Heritage Site, and the conscious decision to continue to militarise the India Ocean at the time of heightened tension between super powers. On 24th February, after weeks of peaceful protests in the heart of Victoria, a panel was set up to address the people on the rationale behind this deal. Mr. Barry Faure from the Department of Foreign Affairs, and incidentally the brother of the President of the Republic, vehemently tried to defend the project, amidst open criticism and backlash from the gathered crowd. He claimed that India needs Seychelles, and further stated that the military base on Assumption Island would be a gift to our small Nation (prompting a dramatic walk-out by a lawyer in attendance and much derisive laughter by the congregation). A unanimous request for a referendum on the matter was called for at that meeting, to give the People of Seychelles a say before our small Nation throws away the “friends of all and enemies of none” status it has diligently maintained since 29th June 1976. Mr. Faure later gave an interview on SBC news, thereby quashing this request by the people.